This piece is a combination of two ancient practices, illustration and illumination. 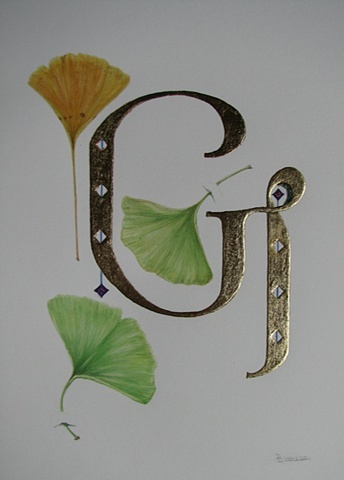 The leaf on the "G" is slightly raised, adding a beautiful luster to the painting. The three gingko leaves are at different stages of deterioration, referring to their life cycle. The painting is framed with all acid-free materials and a simple flat gold leave frame that coordinates with the initial.